Yggdrasil Gaming are relatively new to the gaming industry, but have certainly made a splash with their impressive initial range of games. The name Yggdrasil relates to an ancient tree in Norse mythology and if these early offerings of games are anything to go by, this tree could be very deep rooted. Currently the game range offered by Yggdrasil is small in comparison to their competitors, a company that clearly value quality over quantity. There are 10 slots currently in their range, alongside a number of other casino games such as Keno, Lotto and both Classic Scratch and Video Scratch. All of the slots feature 5 reels, however there are many individual features at each slot, meaning each one offers a different gaming experience. In this overview I look at every aspect of the Yggdrasil slots range. First up I pick out my three favourite slots, before detailing the rest of the range. Next up, I look at which games you’ll be able to play on the go and how. I finish by looking at the pros and cons of the Yggdrasil slot range, finishing by recommending an online casino where you can enjoy the games. This is a very original slot, with a slightly different take on the 5 reel model, where the number of symbols shown on each reel increases as we reach the middle reel, giving the slot a diamond shape. This is a great looking slot with some very ‘interesting’ creatures (whoever designed them might have been affected by the Magic Mushrooms…!) featuring on the reels and has some original features including three different types of wild – all represented by different coloured mushrooms. Another original feature of the slot are the win lines paying out from both the standard left to right and from right to left. Read my review of the Magic Mushrooms slot here. This slot is all about the Joker. At first look this slot seems like something of a standard 5 reel slot and it doesn’t really look like there is much to do here – the game not even featuring a wild symbol. However the Joker makes the game highly playable. Firstly, if he appears three times (he only appears on reels 2, 3 and 4) you’ll win a mystery prize of between of between 1,000 and 6,000 coins. 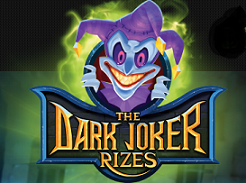 Secondly ANY win will allow you to gamble that win to enter Jokerizer mode where you’ll earn a mystery win of between 20 and 6.000 coins if seeing the Joker twice. This game is worth playing just for the gamble feature. This slot can only be described as ‘Jokerizer’ extra..! Here the game expands on the theme, this time the Joker appearing on all 5 reels. The same mystery prize structure remains, which makes the game exciting in itself, however there are a couple of extras here. Firstly there is a randomly awarded bonus spin, where the joker reels are sticky. Secondly, and perhaps the best feature of the game is the ‘Super Bet’ where you’ll spin the reels for 200 coins in Jokerizer mode, however you’ll be given one free Joker – land one more and you’ve gained a mystery prize. Other games in the range include Draglings, based around a combination of dragon eggs, baby dragons and a rather menacing expanding wild dragon. Robotnik is another wonderful looking original slot, where Robotnik himself will appear and create wilds for you. Fruitoids features some slightly strange looking fruit (not sure I’d eat it) with an original take on the re-spin and multiplier features. Yggdrasil offer a selections of their games on the go using their iSense technology. This uses HTML5 code and allows particle animation, advanced motion animation techniques and CSS3 transitions, meaning that games can be played on a wide range of devices, including of course smartphones, desktops and tablets. Games currently available using iSense include Jokerizer and Magic Mushrooms. It’s easy to be positive about these games, as although a newcomer to the slots industry it’s clear that Yggdrasil have put a lot of effort into producing truly original and amazing looking slots. The range of games are all different, but share a quality and slickness that makes you want to return again and again. The only negative I can come up with right now is that there are not enough games – I want more. Although I’m sure the range will expand very soon. You’ll find this range of games at Mr. Green. This stylish site is making huge strides within the casino industry, the site concentrating on using the very best games available and rejecting the old-school download system. When you join and you’ll enjoy 10 free spins at a select slot (often the latest NetEnt titles) as well as a bonus deal where you can profit to the tune of $350. See the Yggdrasil slots and many more over at www.mrgreen.com now!